Yesterday, President Elect Donald J. Trump tapped Andy Puzder to run the Department of Labor. Over on that Twitter jawn, I was asked for my hot take on what Mr. Puzder’s appointment as Secretary of Labor means for the DOL’s proposed overtime rules. Well, before I answer that question, let’s explore the new appointment. Mr. Puzder is the CEO of CKE Restaurants, which owns, operates and fast-food restaurant franchises Carl’s Jr. and Hardee’s. He received his juris doctorate in 1978 from Washington University School of Law in St. Louis and a former commercial trial lawyer in St. Louis. Business and law; I’ve got the vapors. 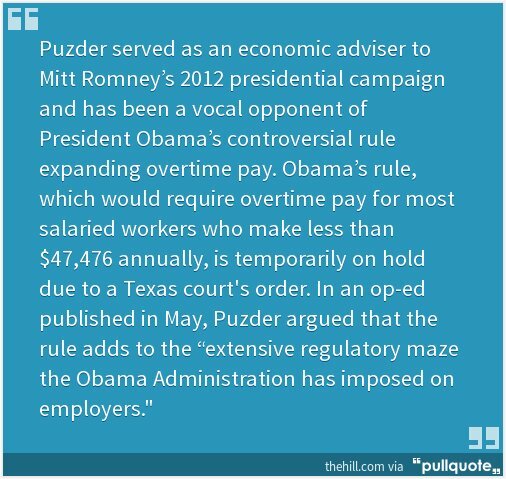 And, according to this report from Lisa Hagen at TheHill.com, Mr. Puzder is not cool with the proposed overtime rules. Hands off, people! He’s my man-crush. 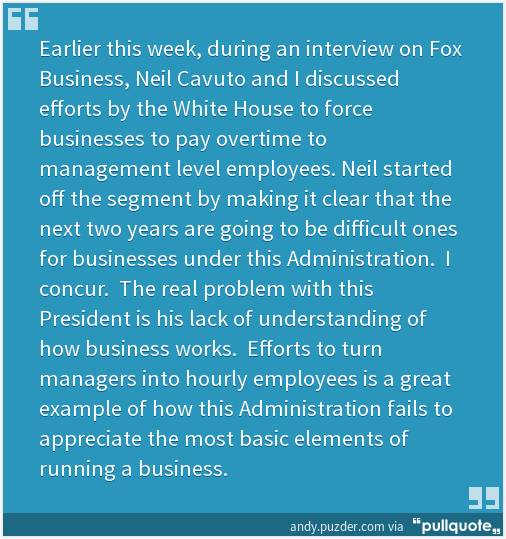 His blog also directs readers to his WSJ op-ed he wrote about the overtime rules. Here’s the money shot. 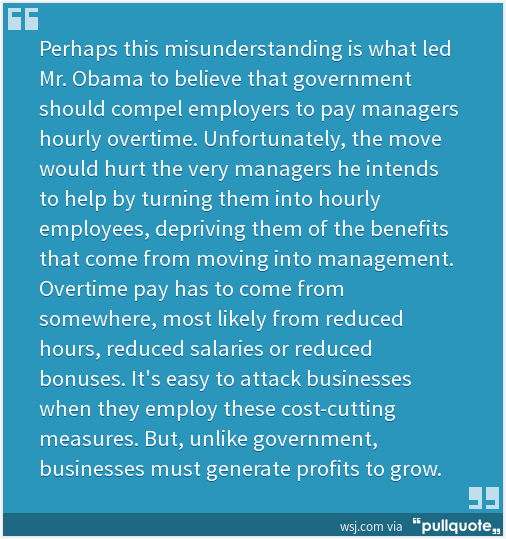 The Overtime Rules may be on life support. Right now, there is a nationwide injunction in place, which will toll the December 1, 2016 start date for the new overtime rules until the Fifth Circuit Court of Appeals can adjudicate the U.S. Department of Labor’s appeal of the injunction. 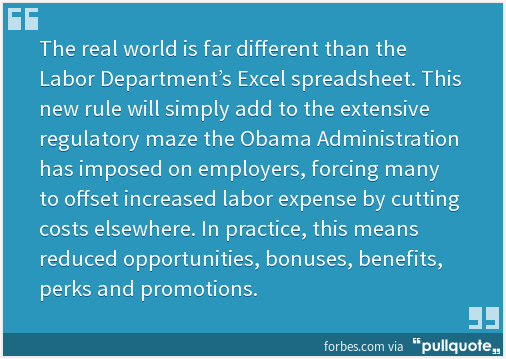 Yesterday, the Fifth Circuit granted the DOL’s request for an expedited briefing schedule. However, the Fifth Circuit won’t rule until February, at the earliest. That’s after President-Elect Trump becomes President Trump and after Mr. Puzder assumes his role as Secretary of Labor. So, I would not be surprised if Mr. Puzder directs the DOL to withdraw its appeal of the nationwide injunction in the interim, especially if Judge Amos L. Mazzant grants summary judgment to the various Chamber of Commerce groups in their pending lawsuit against the DOL to stop the overtime rule. For now, you folks can hold tight. 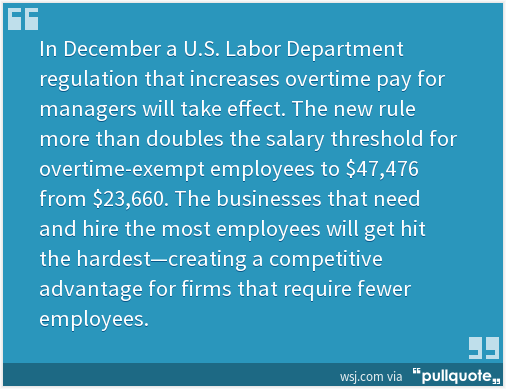 But, in the span of just over a month, we’ve done as close to a full 180 on these overtime rules as is possible.